The best way to identify dangerous issues is to get down on a toddler’s level. By surveying the environment through a small child’s eyes, it’s easier to recognize what areas need improvement. From electrical outlets to electronic equipment, children are curious how things work. 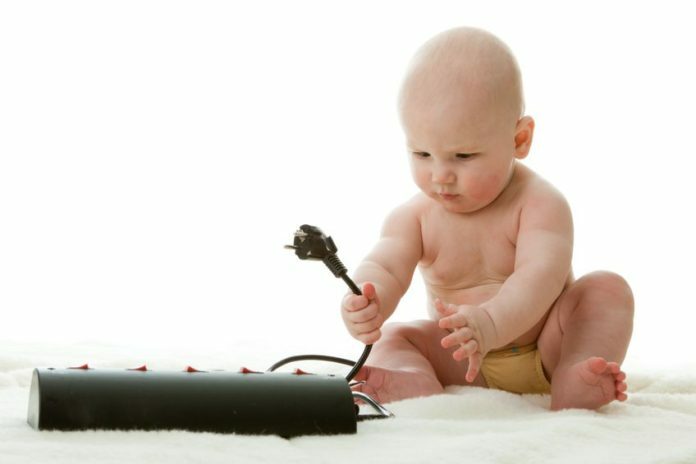 To a small child, an electrical outlet can be a fascinating place to stick objects. The use of plastic caps over electrical sockets eliminates the fear of anyone being electrocuted. Coming in packs of 12 or larger, this is the most cost-effective approach. Replacing outlet covers with safety covers that slide over the outlet opening is an attractive and convenient option. It doesn’t require having to remove a hard to remove plastic cap to use the outlet. This option costs about $4 a cover. A third option is an electrical outlet cover that completely covers the outlet and any electrical plugs that might be plugged into the outlet. This is an excellent choice when using the outlet, because it makes it impossible for a child to pull any wires from the outlet. Covers cost about $3 to $5 per cover. If power strips are being used, it’s important to remember to purchase power strip covers that go over the power strips. This will protect the child from pulling the wires out. At about $10, these covers are mandatory. Many children end up getting hurt when they climb up onto furniture or objects to reach a light switch, so investing in light switch extensions allows the child to be able to turn a light on or off independently. At an average price of about $8, this can be an excellent investment. One of the most dangerous things to do is place a crib near a window. Once a baby can stand, there is the potential that he or she could grab blind or shade cords and wrap them around his or her neck. It’s also a good idea to remove anything a child could climb on from the crib, including crib bumpers, once the child can stand. In addition, taking down the mobile will ensure the child won’t pull it down and hurt his or herself. Keeping harmful chemicals such as household cleaners, laundry detergents, or pesticides on high shelves or cabinets ensures that young children won’t be able to access them. If you’re someone who chooses to keep them on a lower level, then using cabinet locks will keep curious little ones out. It’s also a good idea to use locks where utensils such as knives are located. All medicines, including vitamins, should be kept at higher levels and children’s safety caps should be requested on prescription medicines. If medicine needs to be refrigerated then place it in the back of the refrigerator where it’s out of view. Most people don’t think about the dangers of house plants, but if you choose to have them, then place them out of reach. It makes sense to research the type of plant you’re keeping to make sure it isn’t lethal should it be ingested. Investing in several safety gates to block off certain areas of your home might be a good choice to ensure a child doesn’t venture into dangerous areas. Blocking off access to steps can prevent tumbles down them and limiting access to a kitchen area will ensure that a person can cook safely without the fear that a child will get burned touching a hot oven. Using soft bumpers on coffee tables, end tables, television stands, or anything sharp will ensure that a child won’t get injured should he or she fall against the surface. Placing televisions flush on walls or high on television stands will eliminate the fear that the child will pull the equipment onto his or herself. If you have a fireplace, then use a screen to block access to it. In addition to incorporating safety items in your home, one of the single most important things to remember is that toddlers need to be vigilantly watched at all times. There is no other time in children’s lives where they will be more curious than when they first start walking and exploring their environment. Don’t rely on safety items alone to protect them.